Video views of downtown Springfield serve as the backdrop for this thirty second "Quickie" sign-off of Springfield's long-time NBC-TV Network affiliate. The announcement is delivered by Al Lehmann, who from 1969 to 2014 served as WWLP's house announcer. He also worked as board operator and audio repair engineer for Channel 22 (our thanks goes out to Mr. Lehmann for recently supplying this info). The "22" logo design in this video is slightly different to the one used currently by WWLP-TV. When WWLP-TV signed on initially in March 1953, it was among the first stations in the U.S. to broadcast on the recently opened UHF-TV band, operating on Channel 61 for its first two years. Between 1957 and 1978, WWLP operated two satellite stations in order to increase its presence in the mounainous Pioneer Valley region in which Springfield was part of. The first was WRLP-TV Channel 32, which operated from Greenfield MA. WRLP was a full-time satellite of WWLP up until 1974, when it became semi-indepenent, running during the prime evening hours telecasts of Boston-area pro sports teams, syndicated shows and even its own nightly newscast.  Despite being carried by fifty cable systems in five New England states, WRLP lost mucho moolah for WWLP's owners, Springfield Television, and was taken off the air in March 1978. The second was WWOR-TV Channel 14 in Worcester MA, a defunct UHF-TV station that Springfield Television took control of in 1958. Six years later Channel 14 was rechristened as WJZB-TV and became independent from WWLP's programming, save for simulcasting WWLP's evening newscasts and NBC's The Huntley-Brinkley Report. 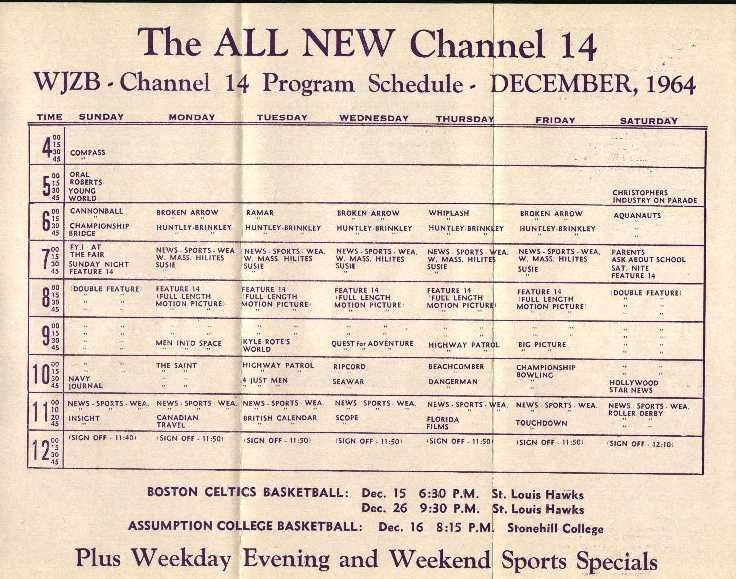 An original printed schedule of WJZB programming from December 1964 can be viewd here. Like WRLP-TV 32, WJZB was a money-loser for all of its run. From 1967 until it went off the air for good in 1969, WJZB was running only the aforementioned WWLP news and Huntley-Brinkley for a grand total of ninety minutes a day of programming, and that only in black-and-white. A sign-off of WWLP/WRLP recorded on 25 July 1976. Includes the final few seconds of the Star Trek theme, brief station IDs by Al Lehmann, a very long sign-off announcement (announcer unknown) and ending with The Lord's Prayer film used by KCPQ-TV Channel 13 in Tacoma WA in its 1985 "sign-off" video.